Alcohol addiction and dependence is at an all-time high. With the availability of alcohol and our culture’s social stance of acceptance, it seems that anyone can fall prey to its seductive clutches. While drinking might seem glamorous and sophisticated at first, it can quickly spiral out of control and become something that is larger than the one imbibing. An alcoholic can feel like there is no life without drinking, and that everything is meaningless and difficult without that needed drink. 1. You will feel better. Alcohol numbs the brain and the body. When you drink to excess, your body has to go into overdrive to metabolize all of this harmful alcohol. This is very taxing on your heart, liver, and kidneys, not to mention your brain. Quitting allows the body a rest from the constant level of toxicity, and the body is freed up to do other things. Your mind, body, and soul will feel better almost instantly. Keep your focus on true and lasting health, and this will make it easier to abstain. 2. Your mental health will improve. Chronic drinkers are prone to bouts of depression, guilt, and even paranoia as they try to hide their addiction from others and justify it to themselves. Without alcohol in the picture, you will find ways to embrace being you, and being proud of who you are and what you are accomplishing. This will boost your mood and improve your mental health. Alcohol ages people significantly faster than time does. The skin dries out and becomes less elastic, and dark circles become permanent fixtures beneath the eyes. Toxins that must release themselves through the skin take on a reddish hue, making the drinker look constantly flush. In addition, the metabolizing action of the liver simply cannot keep up with the excess alcohol in your system, and a condition called jaundice develops, where the skin and eyes take on a yellowish color. Abstaining from alcohol causes all of these unsightly conditions to disappear, giving you a more youthful appearance. The average American spends anywhere from $200-$600 per week on booze, so you can imagine what a strain this must be on family and friends who are watching your finances take a dive as well. When you quit drinking, you have this additional capital freed up to create situations that you do want in life, such as good times with family and friends, vacations, and paying off debt. This can only benefit you as you continue to improve your quality of life. 5. Quitting will allow you to reconnect with people. There is a myth that drinkers buy into that drinking allows you to connect more readily with people, as your inhibitions are temporarily lowered. This is ultimately false, and as the disease of alcoholism takes root, the drinker finds himself in isolation, trying to hide the addiction from family and friends. When you quit, you find a new desire to create new, alcohol-free relationships with people that are authentic and meaningful, and this makes life rich with meaning as well. 6. You will lose weight. They call it beer belly for a reason; this is the unsightly belly fat that hangs over your gut as a result of too many empty calories ingested in too little time, thanks to your excess drinking. Reducing these unnecessary calories will allow you to fortify your body and improve your nutrition with foods that nourish and rebuild, rather than tear down. 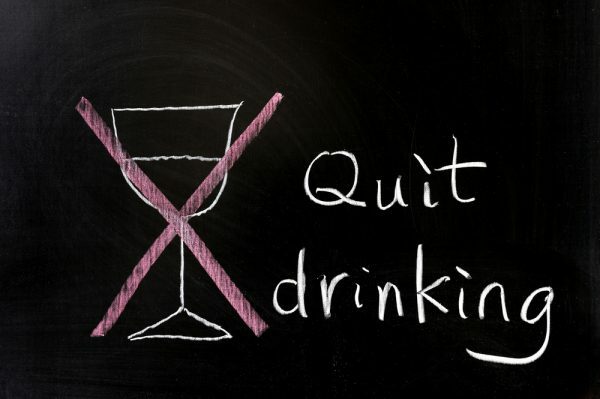 Quitting your drinking will allow you to lose that unwanted fat that you have accumulated. 7. You’ll improve your cardiovascular health. Drinking is enormously taxing on the heart. In fact, heavy drinking has been known to increase your risk of heart disease by almost 40 percent! When you quit, you give your whole body a rest, and this is reflected in how your heart responds to other systems in the body. It’s time to restore emotional, spiritual, and physical health to you. 8. Your social life will improve! Believe it or not, there is life after your drinking buddies. People who quit suddenly find that a whole new world has opened to them in the way of social pursuits and other hobbies. One major contributor to long term sobriety is learning to give back to others in service. Whether you find a charity to give time to, volunteer at a local shelter, or even make regular visits to a senior living community, you’ll find that life takes on a new depth to it when you give to others. You’ll make new connections as well as heal and deepen other relationships in your life as well. Time to make new memories with new people! 9. You’ll improve your sleep quality. Many chronic drinkers are also chronic insomniacs, which is ironic considering that many people drink in order to relax and fall asleep. The reality is that an alcoholic stupor is no match for a quality night’s sleep. Alcohol consumption inhibits the production of melatonin and serotonin, two hormones that must be balanced and present in a regular sleep cycle. When you quit, you allow your body to rebalance and reset, providing you with some much-needed rest. There is life after drinking. There is beauty, meaning and love after drinking. There is support available for you; all you need to do is take the next critical step toward a healthier, happier, more fulfilled life. Reach out, find others who can help you, and believe in yourself enough to give yourself the good life. You deserve it.